In terms of the operating system local manufacturers will have a choice between Windows 7 (and in the future possible also Windows 8) and Android. To me one of the coolest parts is the microscope add-on which can be mounted over the back-side camera (seen about 10:18min into the video). While this doesn't get my DIY-heart as excited as Mike Lee's water drop microscope or Bill Tuk's cabochon microscope I think it's a neat and useful solution. In terms of the price the details will again depend on the specific manufacturers but according to Computerworld Intel is aiming for the $199 to $299 price range. 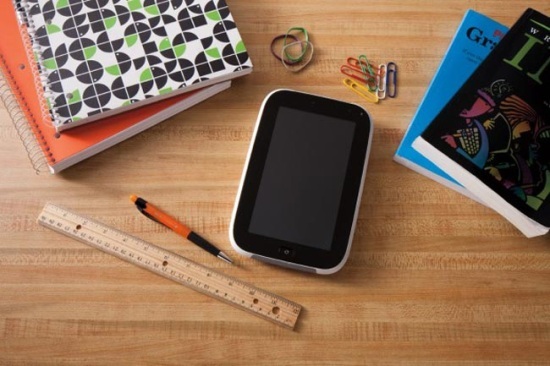 As per the title of this article I think that tablets based on Intel's Studybook design will be strong competitors to OLPC's XO 3.0. While the XO 3.0 is expected to be less expensive than Studybook tablets Intel's global brand recognition and their vast sales operations will likely prove to be significant advantages when dealing with governments and other organizations. Hi Christoph - thanks for sharing the video which gives a good indication of what the Android version may be like (can't imagine the horror of trying to use Win7 on a 7" screen). The ruggedness and splash-resistance will be great; I'm just not sure what else it brings if the educational software is also available elsewhere? Tell me does Intel build this, or will others? And is it known if they also supply teacher PD? Jonathan, in general Intel provides these reference designs and then manufacturers and resellers come up with their own products based on them. Regarding teacher PD I'm not sure whether Intel does that itself but I would assume that they have some in-house expertise which is available to buyers of their Learning Series products. We have had this discussion before. I see no reason to change the conclusions I came to then, namely that computers from Intel and others can only be considered competitive with OLPC XOs if you are asking the wrong questions. The most serious mistakes are not made as a result of wrong answers. The truly dangerous thing is asking the wrong questions. If you want a commercial computer that runs Windows or Android plus commercial apps and commercial education software, then you think that the Intel Classmate or this Intel tablet looks good. But if you want a computer that has some degree of mesh networking, that is extremely rugged, that runs collaborative Free Software for education in a user interface designed for children, that is environmentally friendly, that has an option for solar power, then you are looking for the XO-3. Is Negroponte's cheap computer idea for poor village children winding down? Have the events since he announced the $100 laptop overtaken him and his innovation reduced to a blip in the long journey of the evolution of computing in general? For some times several policymakers have been suggesting that Negroponte's $100 laptop has followed a similar path as its wannabe India's $35 laptop. Both announced something they could not deliver. Both created expectations that changed the perceptions, the expectations. Both are effectively available at two to three times the intended price. Save that Negroponte wants things to be served on a platter while the Govt of India outsourced everything to anyone who could do it. So by the time Negropnte's $100 laptop reaches children's hands in India it costs about over $300. In Australia its cost comes close to $500 as they look at the total cost of ownership. In several countries it may cost $400. The Govt of India has not succeeded in developing one yet. It has little capacity to take it forward but whenever Negroponte's laptop is about to get accepted by a State Government, they announce another breakthrough and that has kept Negorponte's laptop firmly from betting into Indian children's hands. The company that India propped up, Datawind or DW, has been mired in court cases with IIT Rajasthan that finally came out with the truth that they had nothing to do with the project other than procuring the $35 tablet and testing it and found it worthless. DW has been at pains at trashing the Govt of India institutions that they contributed absolutely nothing to the project. But DW managed to get the order it could not deliver on by following the market route and that should be a lesson for Negroponte. DW claimed to have got millions of online orders that people paid for online and that made it cash rich and it could use that money to supply at the market rates of $60 a cheap tablet that some could use for a few days or for teh period of warranty that could have been written cleverly to protect the vendor. However, the Govt of India kept making the task ever more difficult by insisting DW supply everything that a tablet could have for the price that the Govt mandated. That is where the idea became unsustainable. That has left the market with two untenable scenarios. A State Govt Education Secretary feels that while OLPC is the best hardware for villages, the cheap tablets have changed the expectations without even being available, in terms of price at least. They may not do much, but have made it difficult to procure what is more expensive, even if better and more useful. Many in the Govt also feel that Negroponte, unlike Intel or Sa Couto and many others, does not understand how large democratic governments procure. So he has to be content with smaller, somewhat authoritarian governments buying his gadget or pushing through his brother's goodwill in the US State Department. Is Negroponte serious about reaching the underprivileged children? No one else can answer that. But the way he has gone about it in India and China would suggest that he wants to be known as doing the lord's work while raising money for his personal gratification, not children. Can OLPC answer how many give one get one laptops were purchased and how many of them were actually donated? OLPC's challenge is that its founder loves the high ground without getting into the trenches of the real world. It may just be that "olpc" (in small letters) has started flourishing and the OLPC (what Negroponte owns) is dying.